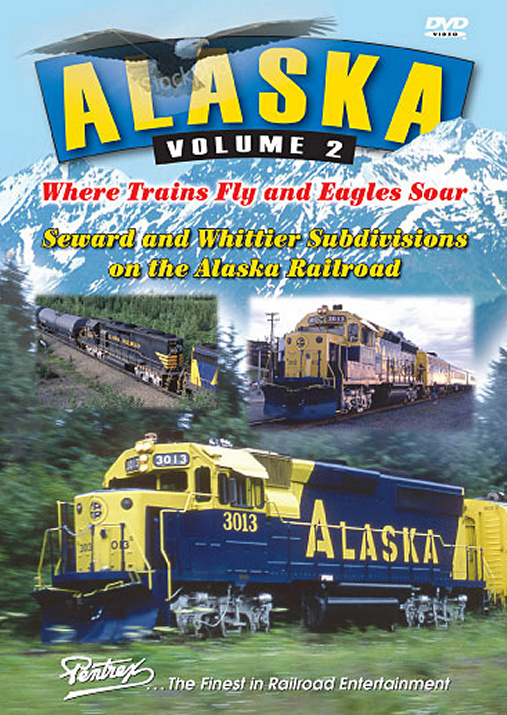 The Alaska Railroad series continues with a fascinating look at operations on the Seward and Whittier Subdivisions during the summer of 1994. We'll treat you to a 3-day tour of the lines between Anchorage, Whittier and Seward, trackage that runs past the incredibly scenic vistas of Turnagain Arm and Kenai Fjords National Park. The route from Seward to Portage takes the trains over the crest of Kenai at 1,060 feet, up 3 percent grades, and through 5 tunnels! Traffic on the Whittier and Seward Subs consists of Anchorage-to-Seward passenger trains; the Whittier Shuttle carrying passengers, cars, and trucks; unit coal trains; and freights that serve the rail barges. These are led by GM diesels including GP35s and GP38s, GP40s and GP49s, plus a few surprises such as an F7-B and a Budd RDC. You'll also see many cabooses at the ends of these trains. sabrail (Canada Quebec) on 2014-05-20 07:36:24.
you see some beautiful scenery of Alaska and train action! The quality of this video is great and also the narration that explain the train that travel through a lot of challenge. I personally like the radio communication between the train and the dispatcher. I recommend this film personally. Alaska, land of the midnight sun. Here is a good video which shows just that. It's an interesting land with high mountains, plenty of water and ships. Souring eagles and other wildlife make appearances, one of which is a Boluga Whale. The producer has covered the territory well and the operations of the railroad in this unique region. A regional railroad with the workings of a Class # 1, in a region steeped with tourism. One of the most unusual features of the railroad is the rails on road travel where vehicles of all sorts travel on the train to connect with other auto roads. It is rather fascinating to see tour buses on flat cars, with their lights on at that. There is nothing like it in the lower 48 states, or regions of southern Canada. Good, hard working trains, tour trains, and lots of excitement. Disappointments: The length of the video is uncharacteristic of Pentrex at only 45 minutes.